Aquaponics is a sustainable food production system that combines a traditional aquaculture (raising aquatic animals such as fish, crayfish or prawns in tanks) with hydroponics (cultivating plants in water) in a symbiotic environment. In the aquaculture, effluents accumulate in the water, increasing toxicity for the fish. This water is led to a hydroponic system where the by-products from the aquaculture are filtered out by the plants as vital nutrients, after which the cleansed water is recirculated back to the animals. The term aquaponics is a portmanteau of the terms aquaculture and hydroponic. Aquaponics is based on the symbolic relationships found in nature and can be loosely described as the combination of aquaculture and hydroponics. Fish effluent from traditional aquaculture systems is used to fertilize plants in a hydroponic system. When the two practices are combined they work in a symbiotic relationship to create a natural growing system. The benefits of keeping fish in an indoor, pollution and parasite free aquaponic system include maximum efficiency of water. University trials showed that growing plants in an aquaponic system used 90% less water than soil grown crops, as the only water lost is through evaporation and transpiration. In traditional aquaculture water is discharged regularly often 10-20% of the total water every day. The high percentage of hormones, water "conditioners" decaying food etc. in that water is often pumped into open streams where it can pollute, or destroy the indigenous balance of the chemistry of waterways, endangering wild aquatic populations. 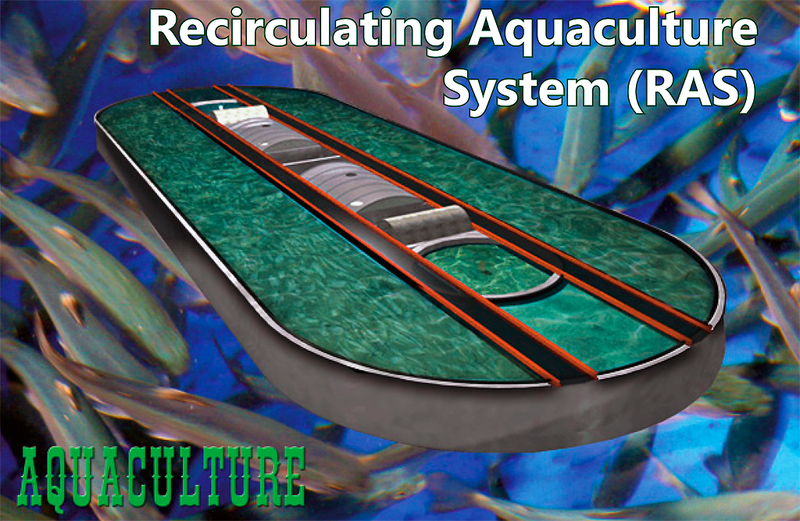 ecoGROW recirculating aquaculture systems utilize oval tanks, each with a perimeter deepwater raceway that emulates a flowing stream. The water temperature, salinity, flow rate and dissolved oxygen levels are modulated to be optimal for each cultured species. Species specific organic diets, area and tank lighting are optimized to give high "healthy" growth rates with no carried fats, whilst the induced water current promotes healthy exercise and flesh tone, as in nature. The central "island" houses the pumps, filtration and oxygenation equipment that maintains the water steam in ideal conditions of "living energy". Instead of discharging water, aquaponics recycles the water in a recirculating system. Water is pumped from the fish tank through grow beds where the water is cleaned by the plants and media before being returned to the fish tank and providing the fish with freshly oxygenated clean water. Other forms of Horticulture rely on the addition of costly chemical nutrients that use valuable time, energy and money. By combining the processes we can easily grow vegetables, herbs and fruits simply by feeding the fish. Best of all there is no need to use chemical fertilizers or pesticides. All ecoGROW facilities use naturally derived nutrients instead of fertilizers and natural predators instead of pesticides, plus fruit pollination is carried out by bees that inhabit the temperature, water and ambient air controlled environment. In an aquaponic system the nutrients are supplied by the fish. They produce ammonia as they breathe and when they excrete waste, this ammonia is converted by beneficial bacteria into nutrients available to the plants. 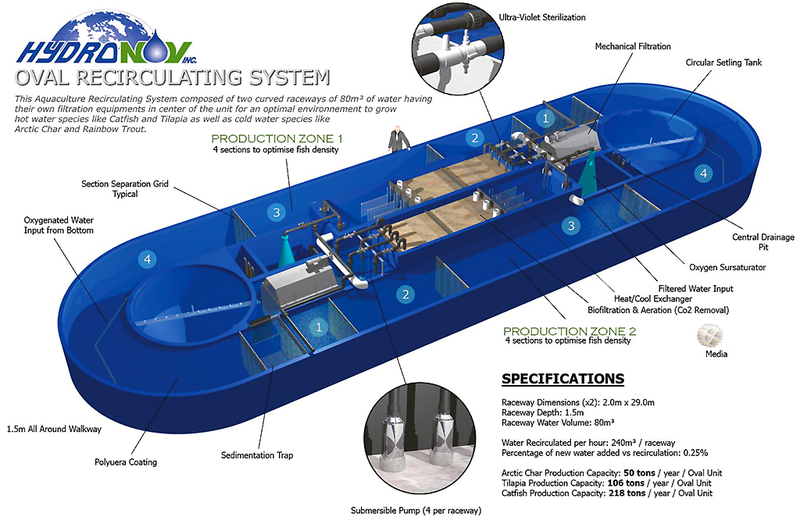 The solids are broken down and filtered in the root matrix, effectively cleaning the water before returning it to the fish tank, via zeolitic and activated carbon filtration, oxygen sparging and UV treatment units. The good bacteria occur naturally in soil, air and water. They colonise the media and a healthy population is an essential ingredient of any aquaponic system. We can describe this simple process as the “nitrogen cycle” a term that many aquarists would be familiar with. By working with nature we encourage natural processes that can be monitored and recorded for lessons in schools about integrated science, biology, horticulture, health, society and the environment. Symbiosis, mutuality and effectiveness of beneficial fungi and bacteria to aid rhizospheric absorption of nutrients is an ongoing study at ecoGROW to ensure optimum vegetable and fruit growth results. The essential link between aquaculture and horticulture in the ecoGROW Food Circle System. 1] To consume the organic offcuts of leaves and roots from our aquaponic horticulture greenhouses to provide high protein organic live food for carnivorous food fish (trout etc.) that grow in the aquaculture sections of our facility. 2] To provide worm castings tea. Tea brewed in oxygen-sparged tanks from fine mesh bags filled with worm castings is high in aerobic bacteria. Oxygenated casting tea gives valuable water soluble nutrients from the worm and fish manure and we breed a larger population of beneficial aerobic bacteria and fungi in the tea by using our oxygen sparging technique. The tea provides full nutrient for the plants and proven disease resistance. Castings Tea is all about microbiology and the bacteria count is tested (measured and evaluated under a microscope), to ensure high aerobic bacteria numbers and dissolved oxygen content. Aerobically composted fish effluent and worm castings work together and are evaluated by this means also, before being bagged for the aerobic brewing of the tea. It is the wide diversity and numbers of microbiology that define a good tea. It’s long been recognized by organic growers and researchers that the use of compost can help prevent some plant diseases. So, it makes sense that liquids derived from compost could also have disease-suppressive characteristics. Besides stimulating growth, compost and compost ‘juice’ can also help fight off diseases by inoculating plants with beneficial organisms. Some of these good microbial benefactors are bacteria and some are yeasts or fungi. These organisms are beneficial if they form a physical barrier against pathogens, or if they effectively compete with or attack the plant pathogens. Castings tea with a bacterial focus and trichoderma fungus to aid in the total microbial activity in the rhizosphere for nutrient cycling and possible disease avoidance is our target from the "nutrient nursery" section of the aquaponics facility.